WooCommerce: Do you want to display products previously ordered by user? One of the best things about supporting our bestselling WooCommerce Product Table plugin is listening to new feature requests. Sometimes it’s obvious whether a particular feature will be popular. Other times, people come up with interesting ideas and we need more information to help us decide. One such example is a recent request to use WooCommerce to display products previously ordered by the logged in user. A few people have recently asked how to display all products purchased by the user who is currently logged in. I’m writing this post to ask who else would be interested in this feature. This will help us to gauge the demand. Depending on the outcome, we may add it to WooCommerce Product Table in future. How would WooCommerce Product Table display products previously ordered by user? The idea is that the customer would either login to their WooCommerce account, or view a dynamic ‘My Previous Products’ page which shows different products depending on the user. The page would include a WooCommerce Product Table listing all products previously ordered by that user. This is different from listing previous orders, because the products wouldn’t be structured by order. 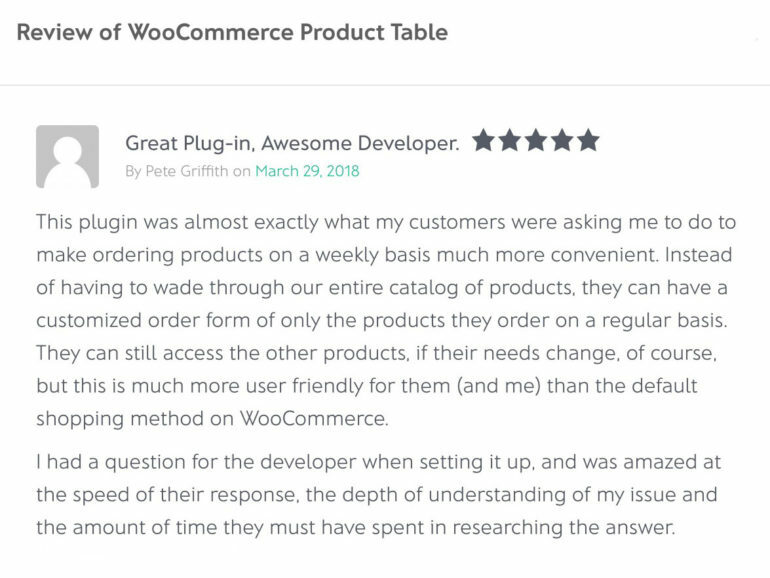 Instead, the WooCommerce table would display all products that the customer has ever ordered. It would display each previous product only once, even if the user has ordered it multiple times. The user would view the list of products previously ordered, search/sort/filter the list as needed to find what they want to re-order, tick the relevant products and add them to the cart. They could then click through to the WooCommerce cart and checkout as usual. Can’t I just use a WooCommerce Repeat Orders plugin? Before telling us whether you’d like to see this feature in WooCommerce Product Table, I’ll tell you what’s already available elsewhere. There are WooCommerce Re-Order plugins available that add an ‘Order Again’ button to the list of orders in the WooCommerce Account page. Users can click this button to add the same products to the cart, creating a quick way to duplicate a previous order. If that’s what you want, then I recommend the WooCommerce Repeat Order Button plugin. This seems to be better than any of the paid ones. 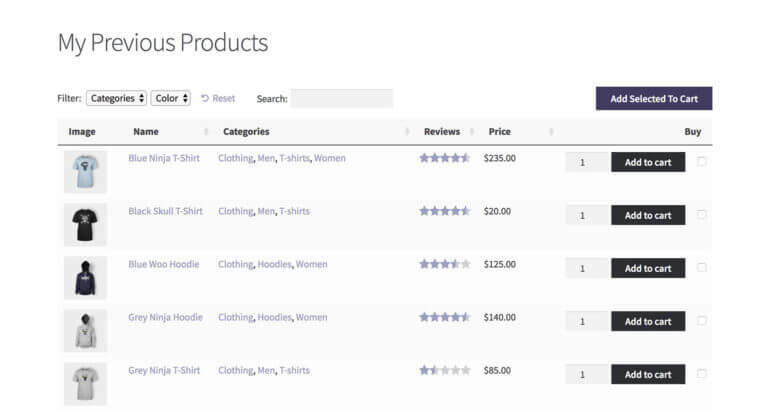 The proposed new feature for WooCommerce Product Table is different because it doesn’t list previous products by order. Instead, it would display products previously purchased by the user who is currently logged in, separate from their previous orders. The customer doesn’t have to remember when they previously ordered each product. 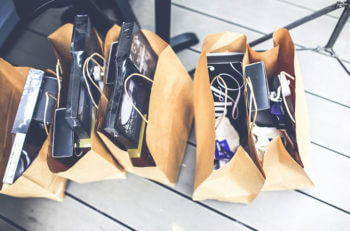 They just need to use the search, sort and filter functions to quickly find their favorite products, add them to the cart, and create a brand new order based on their previous products. Interested in this feature? Tell us now! WooCommerce Product Table doesn’t currently have the ability to show products that the current user has previously purchased. You can display specific products based on data such as their category, tag and much more, but not based on the logged in user’s past orders. We’d love to know if you’d like this feature for your own website. To contact us, please complete our feature request form telling us that you would be interested in using WooCommerce Product Table to display products previously ordered by the current user. We will use this to monitor the amount of demand and decide whether to add this in future. If you really can’t wait, then here are some suggestions on how to achieve something similar straight away. There are 2 ways to do this. Use the instructions in this tutorial to create a custom taxonomy called ‘Customer’. Edit each product and you will see a new ‘Customer’ area on the right hand side of the screen. Use this add the name or ID of all the customers who have purchased this product. You will need to do this regularly, as it’s not possible to do it automatically at the moment. Now, install the free User Specific Content plugin. Create a separate page for each customer and use this plugin to restrict it so that only they can see it. Send each customer a link to their private ordering page. If you want it to happen automatically, then you will need to hire a developer to build this as a bespoke feature on top of WooCommerce Product Table. 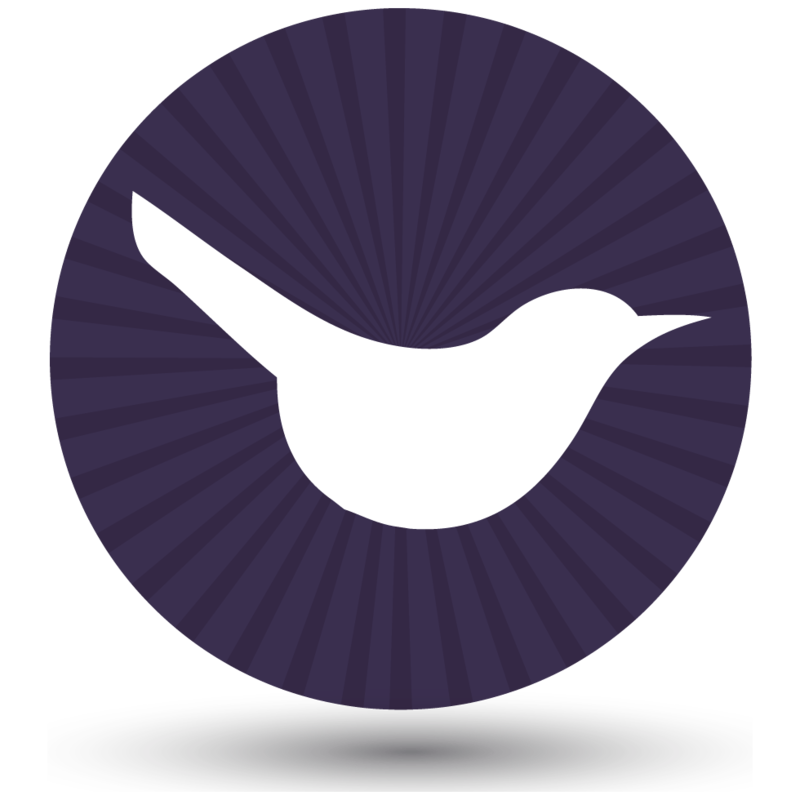 We have partnered with Codeable to provide customization services for our plugins. Post a job on Codeable and wait for their pre-approved WordPress experts to send you a quote.